More and more people these days are tossing their old-school cigarettes and choosing e-cigs. The reasons are many and the decision is personal. But here are some of the top reasons people are snuffing out their traditional, tobacco cigarettes and picking up electronic cigarettes. 1. They're cheaper – Traditional cigarette pricing can vary by brand and area, but for the most part you will find that e-cigs are much less expensive. For example, at SmokeTip.com you can buy a 10-pack of cartridges – the equivalent 1.25 cartons – starting at $15.95 (as of Sept. 2015). Plus, if you consider the money you spend on lighters, breath mints, air fresheners and replacing the occasional piece of clothing that is burned by an errant, smoldering ash, your savings might be far greater. 2. Simple to operate – E-cigs are designed to be simple. 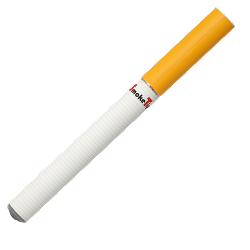 For traditional smokers, there are e-cigs that look like cigarettes and work largely the same way, without the real flame. For most e-cigs, you simply screw the battery part of the device to the mouthpiece and take a drag to activate it. Within seconds the battery has allowed the e-liquid to be heated and for you to receive a burst of flavorful, smoke-like vapor. When the cartridge is empty, you can – depending on style and brand – refill with a pre-filled cartridge or with your choice of e-liquid. 3. Less fire risk – Of course any device with a battery has some risk of fire. But taking the open flame out of the equation greatly reduces the risk. Gone are the days when lighters and matches – a fire risk in and of themselves – are required to enjoy a "smoke." With e-cigs there's no burning cigarette left forgotten in an ashtray or tossed out a car window to potentially spark a fire. And no worries that a loved one will fall asleep with a burning cigarette and cause a catastrophe. 4. More choices – E-cigs come in many varieties and flavors, as well as nicotine strengths. And you can control the mix in many cases. Pre-loaded cartridges come in flavors from tobacco and cherry to chocolate and coffee. And if you buy e-liquid and fill your own cartridges you can mix-and-match flavors as you like and find the perfect taste and blend for you. Also, because you have the say when it comes to nicotine, you can choose the amount you receive or skip it all together if you want just the flavor without the caffeine-like boost of the stimulant. Today you can buy e-cigs with a variety of nicotine levels, such as 18 mg, 16mg, 12 mg, 6 mg and without any nicotine at all. Controlling – and lowering the amount of nicotine – is a great way for former tobacco smokers to become nicotine-free since the addictive stimulant can be gradually eliminated from your e-cigs. 5. Less Stink – From inhale to exhale, e-cigs mimic the experience of smoking dried tobacco. For most people, smoking has never just been about getting a nicotine boost. It's about the process – taking a drag, tasting the flavor and exhaling a plume of smoke. Unfortunately, the process traditionally has left a cloud of lingering, smelly and toxic smoke behind. E-cigs take the stink out and replace it with a quickly dissipating, nearly odorless vapor that doesn't cling to clothes, hair and fabrics. 6. You can vape discreetly – OK, this is a tricky one. While confusion about e-cigarettes is causing them to be banned from many places and communities, in most cases you can find a legal spot to puff on your e-cig far easier than you can to light up an old-style cigarette. Just be courteous and follow the rules and you shouldn't run into any issues – or find yourself being handed a costly ticket for breaking the law. E-cigs, once thought to be a fad that would burn out quickly, appear to be here to stay. Thanks to thoughtful design and features that consumers have been in search of, yesterday's tobacco smokers are today's e-cig users.